As the laptop industry continues its quest for mobility, the desktop replacement market has also been growing. While the Acer Aspire 9802WKMi is a basic 20-inch design, the Dell XPS M2010 (£2239 inc. VAT) takes the concept a step further. One of the most unique laptop designs yet seen, the Dell measures 489 x 383 x 76mm. When closed, the chassis resembles a leather bound briefcase, with a carrying handle included. This makes mobility more comfortable, as the Dell weighs a less-than-portable 8.2kg. The keyboard is a full desktop PC model. Detaching from the chassis to be used via Bluetooth, users can sit back from the 20-inch screen for a better viewpoint. Keyboard quality is excellent, and the touchpad is built into the board. The quality of the 20-inch Super-TFT screen is high, and displays at a WSXGA resolution of 1680 x 1050 pixels. Images are sharp and colourful and the screen is fully positional. A 1.3-megapixel camera is built into the panel for messaging use. Providing strong multimedia ability, an ATi Mobility Radeon X1800 graphics chip is fitted. Scoring 11,828 points from 3DMark 2003 tests, gaming power is impressive. Audio is provided by eight built-in speakers and a subwoofer, providing immersive sound for movies and games. Day-to-day performance is no less competent. Dual-core power is provided by a 2.16GHz Intel Core Duo T2600 processor. Two gigabytes of DDR2 memory helped the Dell score a notable 253 points from MobileMark tests; one of the highest scores yet seen in the WL labs. More unexpected was the mobility of the M2010. Despite its large footprint and weight, the battery ran for 191 minutes under test conditions. It's hard to see when users would use such a large laptop away from mains power, but it's nice to know that they could if they wanted. Adding style and desirability, the optical drive sits on top of the chassis and smoothly pops-up when accessed. Supporting DVD /-RW, compatibility is high. Touch-sensitive buttons are used to gain access, and the transparent disc drive resembles a high-end Hi-Fi design. For using as a home multimedia centre, both 5.1 and 7.1 audio outs allow for connection to external audio equipment. A DVI-out port can equally be used with external digital displays. However, other ports are less comprehensive, with only four USB connections in place. As with the 20-inch Acer, it's hard to see an exact target audience for the Dell XPS M2010. What's certain is Dell has created a unique concept and executed it with style and power, designing the ultimate desktop replacement to date. The downside of a 20-inch TFT panel is it can feel overwhelming when sat too close to the screen. 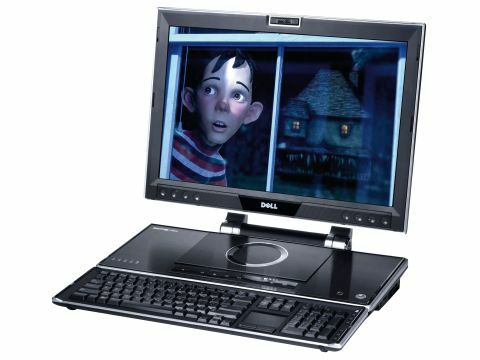 As well as including a detachable keyboard, the screen of the Dell helps eliminate such problems. With height, angle and proximity all fully adjustable, it's easy to find your perfect viewing position.